National Guard Health Affairs is a leading medical complex in the Kingdom of Saudi Arabia providing modern medical care to National Guard employees & their dependents, as well as to Saudi Nationals with tertiary health problems. 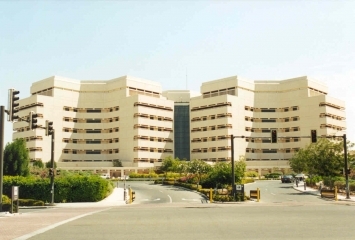 Located in the Central Region, this 1025-bed hospital is the major and the largest medical city under National Guard Health Affairs in Riyadh. It consists of almost all medical specialities and sub-specialities, including state of art cardiac surgery, oncology, dental, OBGYN and other medical and non medical support services and technology. Located in the Western Region, this 500-bed hospital provides medical care services for the Saudi Arabian population. Medical services at King Abdulaziz Medical City-Jeddah includes Anesthesia & ICU, Cardiopulmonary Services, Oral & Dental Surgery, Emergency Medicine, Medical Imaging, Medicine, Obstetrics & Gynecology, Pediatrics, Surgery, and Home Health Care Program. The hospital also has a satellite 60-bed Transitional Care Unit located in downtown Jeddah, the Dar Al Amman Charity Center. The hospital also include Princess Norah Oncology Centre with Medical Oncology and Pediatric Oncology as the main clinical sections. Located in the Eastern Region, this hospital was officially opened on October 14th 2002. The hospital consists of 3 levels of a total area of 35,000 square/meter which has 300 bed-capacity and can accommodate up to 400 beds. There are four Operating Rooms and two Day Surgery Operation Rooms, Main Pharmacy, Laboratory and the VIP ward. Medical degree, American Boards, or Canadian FRCPC/Canadian CCFP-EM, or UK boards, or Australian boards, and A minimum of three to five years post-specialty certification experience in the specialty area in a mid to large size hospital in North America, UK, or Australia. Medical degree, American Boards, or Canadian FRCPC, or UK GMC registration, or Australian boards, and A minimum of 3 years post-specialty certification experience in the specialty area in a mid to large size hospital in North America, UK/Ireland, or Australia/New Zealand.? Medical degree, and American Boards, or Canadian FRCPC, or UK GMC registration, or European equivalent, and A minimum of three years post-specialty certification experience in the speciality area in North America, or Europe. Medical degree, American Boards, or Canadian FRCPC, or UK GMC registration, or Australian boards, and A minimum of 5 years post-specialty certification experience in the specialty area in a mid to large size hospital in North America, UK/Ireland, or Australia/New Zealand.